It’s probably pretty safe to say that Burt Reynolds is the reason some of us love cars. How can you not love the beautiful gold-and-black Trans Am he drove so cavalierly in Smokey and the Bandit? The answer: it’s impossible. 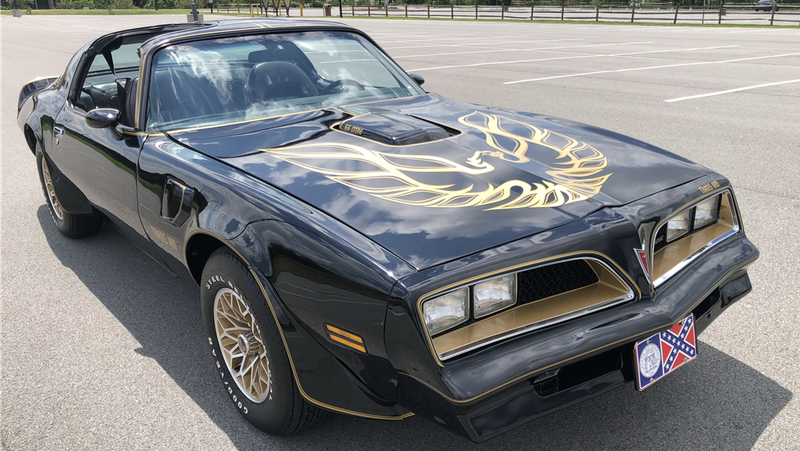 But you, Lucky Soul, could help a little piece of history live on, because Reynolds’ Trans Am is among several of his cars going up for auction. Book your flights to Las Vegas for September 29th, because the Barrett Jackson auction is taking place at the Mandalay Bay Resort, and this is one car you don’t want to miss. Okay, so it’s not the real, actual Black Bandit that was used in the movie. But this was most definitely re-created under the watchful eye of Reynolds himself, who wanted his own personal vehicle to be as close as possible to what you’d find in the movie—with some more modern conveniences added. Because he’s Burt Reynolds. Why the hell not. The listing on the Barrett Jackson website is pretty sparse. But buy this bad boy and you’ll have a custom four-speed automatic transmission with an eight cylinder 400ci Pontiac engine (“freshly rebuilt”). And, as is very important for anyone in a city like Las Vegas, it even has air conditioning. I can imagine this particular car is going to be quite the hot commodity—but don’t worry, there are plenty of Reynolds’ personal cars listed. Such as the 1984 Trans Am Reynolds’ used to promote the Tampa Bay Bandits, his United States Football League team. Or a replica ‘78 Firebird modeled after the car he drove in Hooper. You can even pick up the 1987 Chevy pickup designed to look like the Indy Hauler Reynolds drove in Cannonball Run. They’ve all been recently upgraded or renovated. It’s not currently estimated how much these cars will sell for, but my guess is that they’re going to be pretty highly in demand given that the man is something of a legend. So, if you’re interested, there’s no time to waste.